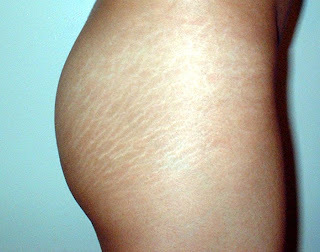 Q: What's the difference between cellulite and stretch marks? I have white marks at the top of my thighs - I can't tell if their stretch marks of cellulite. Their white, as mentioned, and they protrude slightly. Could someone clear this up for me as I need to know so that I can find a cream to reduce the visible appearance! A: That what you're describing is stretch marks. Cellulite is often described like orange peel like skin or cottage cheese. It's dimpled, and you can see little bumps and lumps on skin. You cannot completely cure stretch marks, but you can make them less visible by using body lotions and oils. That is also the way to prevent further stretch marks to appear. Also, if they bother you too much, you can have them treated with laser. If you're worried about cellulite, too, here's the list of food that helps fighting cellulite. Alcohol, cigarettes - generally they're very bad for your skin tone, and improve the appearance of cellulite. Alcohol also dehydrates your body. Physical inactivity - less physically active you are more calories don't end up burned but stored. Also inactivity makes your circulation worse, and so cellulite can form more easily. Tight clothes - those are not good for your blood and lymph circulation, so avoid them if possible.